Home » international news » The West & its politics in the Arab countries: Where will the war refugees go? As more and more European countries seal their borders, where will the war refugees go? In the latest twist to the burgeoning refugee crisis, mainly Syrians fleeing from a war-ravaged country in search of a better and safer life in Europe, Austria has decided to stop refugees from coming in. On Tuesday, (28 March 2017) Austrian Chancellor Christen asked the European Union to exempt his country from taking in more asylum seekers claiming that his country had already taken in enough refugees over the past two years. However, Austria is not the only European country to decide to stop entry of asylum seekers. Hungary is building a second fence along its southern borders to keep the refugees out. During 2015 and 2016, Hungary, France and Germany witnessed a surge in hate crimes against migrants and refugees. In 2016, over 3,000 hate crimes were committed against refugees and migrants in Germany. The mayor of Calais banned distribution of food to migrants. The UK forced a victim of torture to return. In the USA hate crimes against Muslims spiked from 2014 to 2015. The world is currently witnessing the largest and most rapid escalation ever in the number of people being forced out of their homes. It has created perhaps the highest level of displacement since World War II. 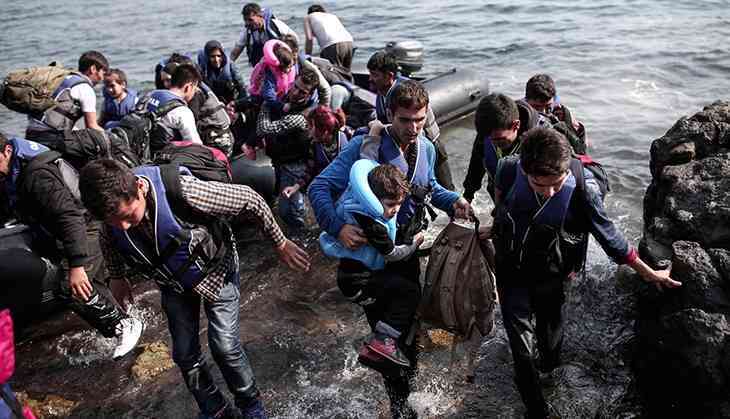 Millions of people are fleeing conflict in Syria, Iraq, Afghanistan and Ukraine. It is an era of violence in the Middle East and North Africa, with nine civil wars now going on in Muslim countries between Pakistan and Nigeria. There are no signs that these wars will end soon. Most of the Syrian refugees who fled to Turkey, Lebanon and Jordan in 2011 and 2012, had hoped that the war would soon be over and they could return. It is only in the last couple of years, realising that this was not going to happen, that they began to seek permanent sanctuary elsewhere. They started the desperate and perilous journey to Europe. The End of Cold war changed the global power balance in favour of the West. The first Iraq War, the second Iraq War, regime changes in Afghanistan, Libya and the ongoing proxy war in Syria and Yemen, were carried out by the Western states with absolute impunity and total disregard to the lives of the millions of people living in these countries. From December 2011, NATO warplanes have been delivering weapons to the Syrian opposition through the Turkish military. British and French special force trainers were already on the ground training Syrian rebels while the CIA provided communications equipment and intelligence to the rebels. The US Defence Intelligence Agency report in 2012, which was declassified in May 2015, admitted that “the West supported the creation of ISIS at its inception...as a way to isolate Syria”. (Judicial Watch). NATO’s retired Secretary General, General Wesley Clark has said that a few weeks after 9/11, he had received a memo from the office of the US Secretary of State which revealed plans to “attack and destroy the governments in seven countries in five years”, starting with Iraq and moving on to “Syria, Lebanon, Libya, Somalia, Sudan and Iran”. That these wars were planned to retain control of the region's vast oil and gas resources is well known today. The victors are never held responsible for their war crimes. The Americans and the European powers are not only escaping their responsibility for the crimes of war in the Middle East, they have shut the door on the face of millions of war refugees begging for a chance to remain alive. To the imperialists, the war victims are not worthy of compassion. The pushback and rising hate crimes against refugees is a major obstacle for the EU’s refugee resettlement program. The European Commission had decided to resettle 1,60,000 refugees by the end of September 2017. But only a fraction of those asylum seekers, only about 14,500 have actually been taken in by European countries thus far. For now, it seems, many of those migrants are stuck in Italy and Greece. There is no international law or a convention which can address the issue of war refugees. It is clear that the Refugee Convention of 1951 is not capable of addressing the issue of war refugees of today. These are not victims of discrimination and persecution. These are victims of a brutal war being waged in their countries by forces supported by Western powers. While European states are closing their doors raising issues of security, culture and adverse impact on their economy, it is the poor neighbouring countries which are still hosting the bulk of the refugees till date. According to UNHCR, relatively poor, developing countries are hosting 14 million of the world’s 16.1 million refugees, or approximately 86% – with countries designated “least developed” taking in four million. Kenya, Turkey, Pakistan, Lebanon, Ethiopia, the Democratic Republic of Congo, and Chad – which are grappling with extreme poverty and instability are the largest hosts of the war-displaced people. The attempts to establish pro-western, pro-Israeli governments in the Middle East is based on the hollow claim of civilisational superiority of the Western civilisation. The West’s agenda of hegemony and imperialist control is fundamentally incompatible with the idea of democracy. The imperialist has not been able to crush the Arab people’s irresistible aspirations for political independence and cultural autonomy. Whether we like it or not, this war may ultimately change the context of the 'global' in the Middle East. Despite what the sceptics of revolutionary visions, apologists of the hegemonic status quo may say, or believe, the evidence from the ground supports the contrary view. We witness a new of paradigm of resistance and Arab solidarity that have been developed by Hezbollah, within Lebanon and across the region, by Hamas in Palestine and the Muslim brotherhood in Egypt and other Arab countries, including Jordan. Tapan Bose is Secretary General, South As‎ia Forum for Human Rights.